Woke at six to find that the Taca Airlines desk didn’t open until 09:30. As our flight was at 10:00, this was a little worrying. We were more than a little miffed when we found out that the flight was, in fact, at 15:00, as we had already returned the hire car. Spirits did not improve on finding that we each had to fork out $13 airport taxes which hadn’t been paid by the Belizean government. 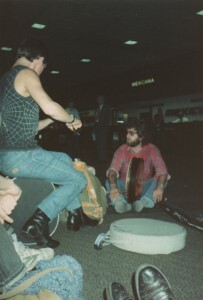 At this point Cat ‘n Fiddle decided to liven things up a little by busking in the middle of the concourse. At 10:45 we left the airport to catch the bus downtown. At 11:15 we re-entered the airport having discovered that the bus ride was a two-and-a-half hour round trip. When the Taca aircraft finally arrived, Simon from Cat ‘n Fiddle was delighted to note that it didn’t have propellers – it was actually a Boeing 767 – and we all had a giggle watching Jerry’s Caterers and the incompetent baggage handlers loading the ‘plane. 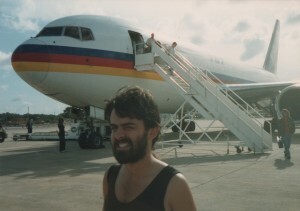 I like Taca Airlines – the stewardesses kept up a constant shuttle from one end of the ‘plane to the other and felt strangely obliged to give you a drink each time they passed. For a two-hour flight, large Baileys, red wine and dark rum were quite sufficient.